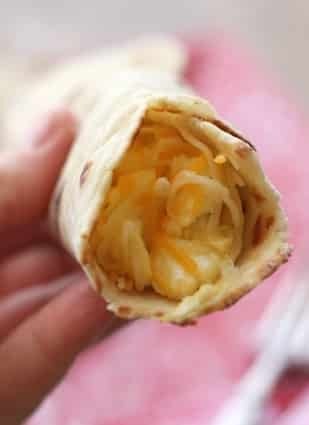 A great flour tortilla should be soft and bendable; it shouldn’t tear or crumble apart when you roll it into a burrito. Above all else, it should taste good! I wanted a gluten free version of our favorite flour tortillas, basically, Gluten Free Flour Tortillas that don’t taste gluten-free. Finding a combination of ingredients that would produce the perfect tortilla and in the process not taste like weird, chewy cardboard is something I almost gave up on many times. While this recipe contains three times as many ingredients as traditional tortillas with their simple combination of flour, salt, water, and oil; the ingredients aren’t complicated ones. Each of these items works with the others to create the perfect tortilla. I tested this recipe six times before sharing it here for the first time. Since then, we’ve made these tortillas countless times over the past few years. 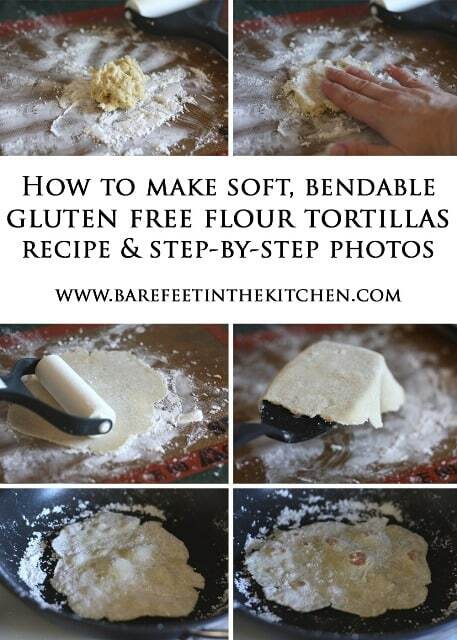 These Gluten Free Flour Tortillas turn out perfectly every time. 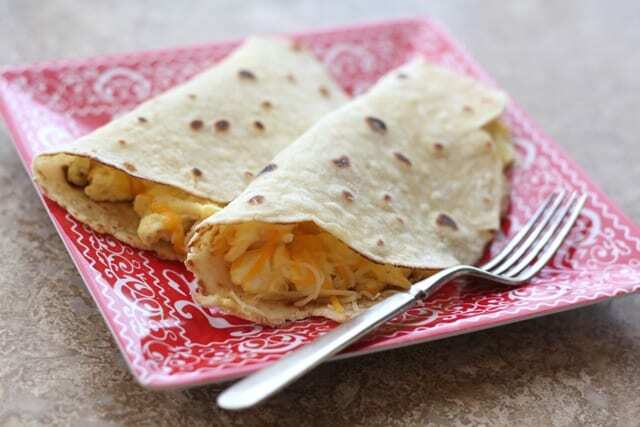 When I finally figured out this recipe, we had more breakfast burritos and breakfast tacos that month than we had eaten in the past two years. My whole family is thrilled with this recipe. For more gluten-free recipes that don’t “taste” gluten-free, check out all of the Gluten-Free Dessert Recipes! COOK’S NOTE: You can roll these tortillas thicker, like naan bread, or as thin as possible. If you are more of a perfectionist than I am, you can even roll the lightly floured dough into a ball and create much more perfectly round tortillas. Kitchen Tip: I use this style of pastry roller, this pan, or this electric griddle to make this recipe. When you are ready to make the tortillas, heat a large non stick pan over medium high heat. Lightly dust a mat or countertop with a tablespoon of potato starch. The amount doesn't need to be exact, just lightly rub the potato starch across the surface with your hands, so the tortillas won't stick to the counter. You will dust your work surface with a fresh sprinkling of potato starch for every tortilla! (I used about 2 teaspoons for each tortilla.) This makes a huge difference in the ease of rolling out the tortillas. Scoop a golf ball size amount of dough and drop it onto the floured surface. Roll it around just a bit to lightly coat the dough with starch. Press down with your hands to flatten the dough. I flip it over a time or two, just to make sure it is coated in the starch to avoid sticking. Use a pastry roller or lightly dusted rolling pin to spread it out into a circle. Use a large spatula to transfer it to the hot pan. Cook on each side for 60-90 seconds, allowing it to brown and start to bubble before flipping it over. Wrap the tortillas in a thin tea towel to keep them warm until ready to eat. Serve immediately or let cool and store in an airtight container until ready to serve. Reheat for 10-15 seconds in the microwave or in a hot skillet, just before serving. The tortillas should keep nicely at room temperature for a day or two. Enjoy! You can roll these tortillas thicker, like naan bread, or as thin as possible. If you are more of a perfectionist than I am, you can even roll the lightly floured dough into a ball and create much more perfectly round tortillas. Regrettably, I don’t have a non-stick on handy. Can I use the broiler setting in my oven or just “fry” the tortillas in my stainless steel skillet with oil?Thanks! Unfortunately, the tortillas are a somewhat finicky recipe. I haven't had the best luck with any other pans. It's certainly worth a try though. I wouldn't use oil though. Just make sure they're well dusted in flour and try them in the stainless pan. Let me know how it works for you! I am a GF personal chef and cook for folks who do not eat eggs. 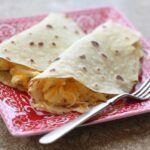 Wondering if anyone has tried this great recipe with and egg replacer? These are delicious! They really almost taste like homemade flour tortillas. My dough was too sticky and even though I was using piles of potato starch they would not roll out with just a rolling pin. I almost cried and gave up, (no kidding) but then I remembered the parchment paper trick for rolling sticky things. I used the potato starch as normal but rolled them between two small sheets of parchment. Then I left the rolled out dough on the parchment that it wanted to stick to (usually the top) and flipped it right into the pan with the parchment attached. The parchment will release on its own about 30 seconds in and then the tortilla can be flipped and they came out amazing! I was pleasantly pleased with this recipe. So much better than any gluten-free store bought tortillas. I did however found them a little floury but that may have been my own problem as I was trying to make sure they didn't stick to the counter where I rolled them out. I will definitely make this recipe again but try to limit the amount of potato starch that I use. Good starter recipe. I found it to be way to wet to roll out. Used at least another cup of flour in the mix. I think I will try shortening next time instead of oil, maybe less wet. Made these today, they tasted amazing! Thanks so much! Also found that, after rolling the dough flat, you can use a bowl or the top of a pan to cut the dough into a perfectly round tortilla! That's a great tip, Ash. I'm glad that you enjoyed the tortillas! These look wonderful! I wonder though, do you think I could use almond milk instead if cow,'s milk? I've never tried that, Jan. It's certainly worth a try. If you do make them that way, let me know how it turns out! Fantastic! Turned out better than store bought. I found that flattening the dough in parchment paper is really helpful, and a little less messy. Parchment really does help, Michelle. I'm so glad you enjoyed the tortillas.